OK, I know what you are thinking…. “It is summer….why are you reminding me about the cold winter months?” It may be summer but I am already dreaming about winter in French Alps! It is never too soon to start thinking about your next winter vacation. Nothing can compare to this majestic place! Storybook settings covered in white snow with majestic mountains beckon you to visit. Did I catch your attention? Please read on! 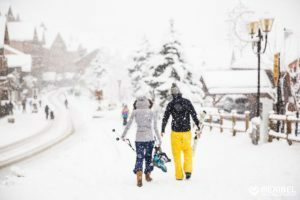 Although some resorts are open year-round, most of the resorts open mid-December and they stay open until early April. Of course, the resorts are quite busy during the Christmas and New Year weeks but otherwise, there are plenty of places with availability during the remainder of the season. Some weeks are quieter than others and SVP Tours can certainly help you find a week where you can lay down some fresh tracks in new snow! WHICH RESORT IS BEST FOR YOUR FAMILY OR GROUP OF FRIENDS? Just like people, each resort in the Alps has its own personality! Some resorts cater to singles and couples and others to families. Some resorts are much more posh while others have a more laid-back vibe. Take a look at the “Ski Adventures” portion of our website for some guidance in this regard. There are so many options- Chamonix, Courchevel, Megeve, Méribel, Val d’Isere to name a few! What are some of the experiences that we can offer? The possibilities are endless for the active traveler! If you want to take a break from the slopes, we can offer you cooking classes, cocktail mixology classes, fine dining, the most luxurious spa treatments and some fun apres-ski nightlife. Please give us a call at (860) 643-0825 or email us at info@svptours.com with any questions or requests that you may have. If you can dream it, we can make it happen!